Flags and holiday lights fly over the Rockefeller Center Ice Rink during Christmas in New York City. 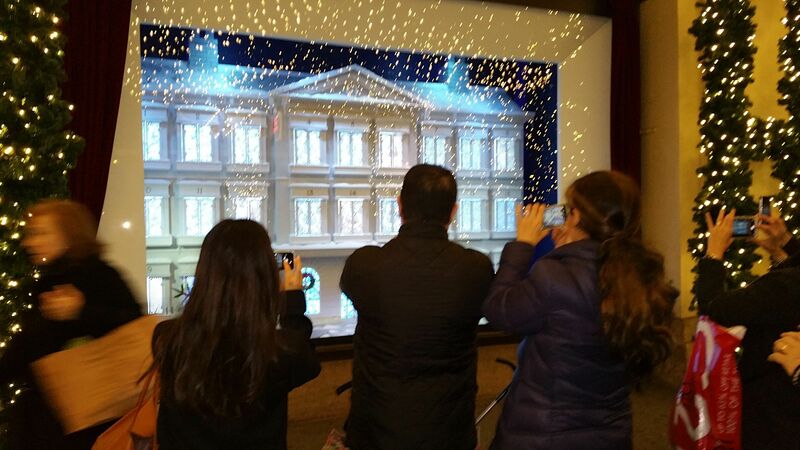 Holiday windows at Lord & Taylor are a favorite with tourists looking for that perfect Christmas in New York City experience. 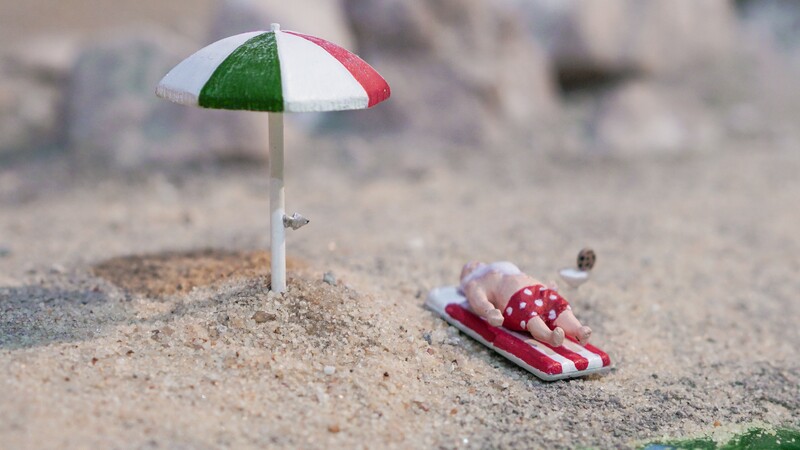 Mini Santa takes a beach break from his holiday duties at Gulliver's Gate. Grab the kids and get into the holiday spirit by experiencing all that Christmas in New York City has to offer during the November to January winter holidays when most family activities are free. Recently, I’ve been bursting at the seams with holiday spirit (I had too much to eat at Thanksgiving), and being in the city that never sleeps, I’ve found an endless list of activities to spread some Christmas joy this season and for years to come. The 85th Rockefeller Center Christmas Tree is a must-see. A-list celebrities appear to celebrate the illumination of this Christmas in New York City symbol, while performances typically feature the Radio City Rockettes and ice skaters twirling in the Rockefeller Ice Rink. The tree, which Rockefeller Center requires to be at least 65 feet-tall and 35 feet-wide, shines with over five miles of lights and a giant star adorning the tip. Located in the center of the complex of buildings between 48th and 51st Streets and 5th and 6th Avenues, the tree attracts gawking tourists from all over, so be sure to be very, very early to grab a good spot. And in 2018, the Rockefeller Christmas tree got a facelift. Daniel Libeskind, the architect for the reconstruction of the World Trade Center, designed a stunning 900-pound, 3-D star composed of 70 illuminated spikes and encrusted with three million Swarovski crystals. To call it dazzling would be an understatement. Need a travel deal on New York City hotels? Go here. Though not as renowned as the event at Rockefeller Center, Bryant Park Tree Lighting Skate-tacular tree lighting ceremony has the upside of fewer crowds and a few star appearances, including opera singers and professional ice skaters. If you arrive early, you can, free of charge, grab a pair of blue ice skates before and after the ceremony or simply observe all the action from one of the metal chairs surrounding the ice rink. (Rental rates apply for the rest of the season, but the skating is always free!) Afterward, check out the carousel and the tented booths of one of New York’s top Christmas Markets, where one-of-a-kind arts and crafts are featured and hot cider and hot chocolate will keep the chill off. The American Museum of Natural History has its own Christmas tree, though by no means is it comparable to those of Rockefeller Center and Bryant Park. Yet, what you’ll find dangling from this pine is arguably much more interesting than just bright lights. Its boughs are decked with hundreds of origami shapes, adhering to a new theme each year. Like a “Where’s Waldo” kids book, the tree draws many gawkers who, no matter how long they scrutinize the tree, can always find one-after-another of hidden wonders in its branches. Check their site for free admission days for a fun and frugal Christmas in New York City celebration. If you missed out on their performance at the 30 Rock tree lighting, don’t miss out on the Radio City Christmas Spectacular featuring the Rockettes at Radio City Music Hall. Whether it’s the kick line of scantily clad women or the kick line of scantily clad women dressed as candy canes that gets your attention, the dazzling musical will be sure to put a smile on everyone’s face. If you haven’t seen this in its over 75-year run, the fantastic new lighting effects and computer animated imagery decorating the stage make it high time. Officially kicking off the holiday season at the end of November, the Grand Central Terminal Holiday Fair is a big, bold, indoor version of Europe’s famed Christmas Markets. Families can begin a tour of the famous railway station at the round Information Booth. (According to their website, it has a hidden, spiral staircase leading to the Information Booth on the Lower Level.) Appropriately located, you can also check out the annual Holiday Train Show while you are at the station. On a budget? Slash nearly 50% off of all your favorite New York City attractions here. The famed Constellation Sky Ceiling is an astronomical mural inspired by the French painter Paul Helleu that floats above the 80,000-square-foot Main Concourse. Its view of the Mediterranean sky with 2,500 stars (60 of which are lighted with fiber optics) is said by astronomers to be backwards but it’s extraordinary anyway. Public tours of the station are given daily at 12:30pm, but there’s an audio tour you can do yourself any time to behold the unique beauty of Christmas in New York City tucked away in Grand Central Station. Then, take the subway over to the Museum of Modern Art, or MoMA, which always has a special exhibit over the holidays. There’s forever something going on at MoMA, with family tours led by kid-friendly docents on weekends, and regular film screenings. Make sure to reserve tickets ahead of time or arrive early to purchase them at the front desk, as the special programs sell out fairly quickly. Admission is free on Wednesday, but the lines are endless, so plan ahead to keep spirits high on your Christmas in New York City journey. A new New York attraction, Gulliver’s Gate, took three years of planning and hundreds of talented artisans to create. Tucked into 49,000 square feet just off Times Square, this is a miniature view of the world’s great monuments. The exhibits’ interactivity is triggered by your admission key and, if you look closely, you’ll catch hundreds of HO scale (1:87) people and objects created by artisans from that destination, each unique. For the holidays, they’ve designed surprise miniatures, including The Grinch, Grandma getting run over by a reindeer, Santa lounging on a beach, Elsa from “Frozen” and so much more your family can hunt for. Staff Navigators are happy to help out. If you’re stuck for gift ideas, bring everyone into the 128-lens photo booth, get snapped and mapped, and order a 3D printed figurine to take home. (A 1:87 clone of it can be placed in any exhibit, guaranteeing you become world citizens.) Co-founder Michael Langer says his team’s $40 million project celebrates the world’s diversity and ability for nations to peacefully co-exist when their national treasures are positioned side by side. While you can certainly walk around and enjoy all of the sights New York City has to offer, a sightseeing tour bus gives riders an easier way to traverse the city, take in the spectacular lights that blanket each ciy block, and get some fresh air. Cruising along on one of these double-decker buses is perfect for the older generation or littler ones, who will enjoy the unique storefront displays of Macy’s and Lord & Taylor, the massive snowflakes of Saks on Fifth Avenue and a little history of Christmas in the city from the friendly tour guide. Board early for the best sight-seeing seats, or plan ahead and dress according to the weather. On select dates in December, the Bronx Zoo will hold special animal feedings, when animals throughout the zoo are given presents to unwrap -– or should I say, tear up. Throughout the season, the “Wild Survivors: Animals in 4-D” will show regularly in the zoo’s theatre. Also located in the Bronx, the New York Botanical Garden celebrates the Christmas season with its Garden Holiday Train Show. It’s a long-standing favorite for locals looking to celebrate Christmas in New York City. The kids can watch as model trains speed along more than a quarter mile of track at the Garden’s Enid A Haupt Conservatory or sip on a hot chocolate at one of the cafes. A unique fact about the model train display: All recreations are made entirely from natural resources –- even the model of the Brooklyn Bridge is made out of sugar pine cones! It’s totally insta-worthy and inspiring for young model makers. If you’re planning a family splurge, make it happen two-by-two at the very posh The Langham, New York, Fifth Avenue, where a 2 nights’ stay in a deluxe room or larger, 2 passes for NYBG’s Holiday Train Show, and 2 Metro-North train tickets right there start at $845 plus tax per night. Don’t forget, too, that every city block is alive with dazzling lights, so simply taking a stroll downtown will make for an awesome time during the holidays. Wherever you go, be sure to gaze skyward to see the lights on the Empire State Building, whose colors change according to specific dates and holidays. We love Christmas Markets and best of all, they’re free to roam around in, providing endlessly fascinating art objets, crafts, clothes, jewelry and other gift items your kids will want to see… but probably not own. At Bryant Park, a Christmas Market of small shops surrounds the ice skating pond. If you’re hungry or want to really get into the spirit with a mug of hot chocolate and fluffy Belgian waffles, try one of the Pond’s concession stands or mill around until you find a specialty food shop. Another popular market for handcrafts and artwork is the Columbus Circle Holiday Market, opposite the Time Warner Center. After your shopping spree, head to the Holiday Market at Union Square, where you’ll find tents filled with all sorts of Christmas goodies, of the fresh produce and edible variety, as well as arts and crafts items. While there are certainly thousands of stores and many more things to do at Christmas in New York City, the end of the year brings the most spectacular events of all in the Big Apple. Those who can brave the cold and the crowds should experience Times Square and the New Year’s Eve ball drop, the Midnight Central Park Mini-Marathon, as well as the New Year’s Eve fireworks held in many venues. For more information and current events schedules, check out the NYC & Company website. 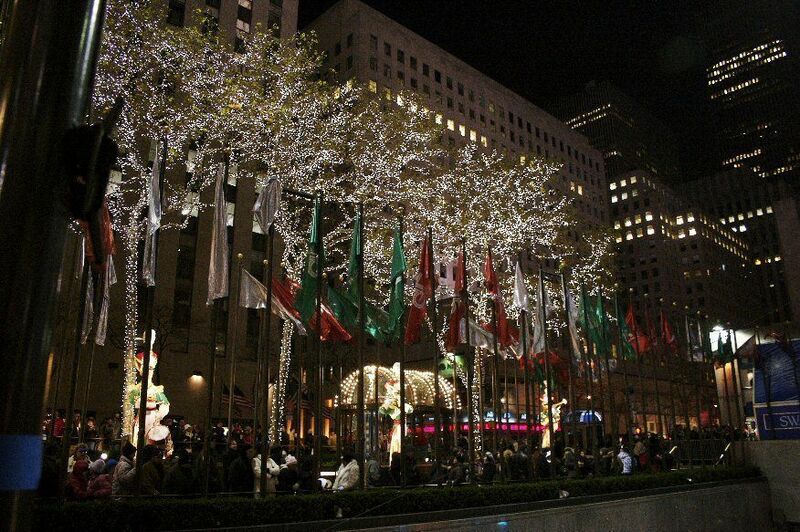 What’s your favorite way to celebrate Christmas in New York City? Let us know by leaving a comment below!